I write at length on this blog about the National Air Traffic Controllers Association (NATCA) and how they've been given a raw labor deal by FAA. One of the main issues that always comes up in their press releases about this mess is that due to a lack of trained controllers, NATCA members must work long, tiring hours which can lead to an increase in the possibility of an incident. "A brand-new iPhone application from Firemint gives users a taste of what it’s like to work as an air traffic controller, sequencing and directing aircraft in your airspace to safe landings. The "playing field" is an overhead view of an airport traffic area. As aircraft enter your airspace, you are to direct their flight path to a runway for landing: airliners to the long runway, small planes to the short runway, and helicopters to the helipad. 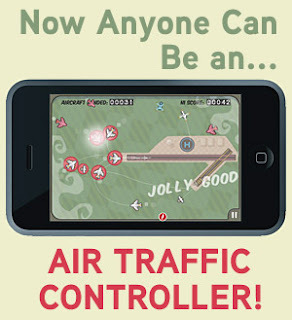 The game starts out on a fairly simple level, but of course things quickly get more challenging as the amount of air traffic on your screen soon increases dramatically. The game ends with the first mid-air collision." "I downloaded this game a week ago, and I still keep coming back to try to get a new high score," Cnet blog author Jason Parker wrote. 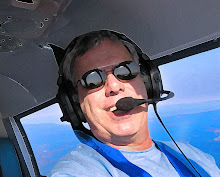 "Flight Control is both incredibly challenging and very addicting, and definitely worth the 99 cent price tag." In playing the game myself, I found it to live up to its addictive promise. Each game starts out very benign, a jet or two inbound, maybe a rogue helicopter, and some bozo in his J3 invading your Class Bravo. You easily aim them at the runway ends and the helipad, but as they are following orders from ATC (actually you drag your finger across the screen to simulate their proposed routing), a few more targets enter your sector. You work them, but now two, no THREE helicopters are inbound! And remember that clown in the J3? Now his buddy in a Cessna 310 and two dudes in trainers are trying to get tangled up with more pressurized tubes full of Grandmas and a UPS Heavy. Your pulse races, your heart pounds. As the targets converge, their blips pulsate red, a mid-air is imminent. Your fingers cannot go fast enough - more converging targets...now who's that idiot in the %$#@!&*% BLIMP!!!!! And then...BAM, that crashing noise you hear on the iPhone is the sound of a United, a Northwest, a medivac chopper and a Cessna 150 all colliding in a ball of fire, smoke and vaporized tray tables. Sorry pal, Game Over. Play this game for a little while, and then imagine yourself hunched over a real ATC radar screen, with REAL targets full of REAL humans converging. I believe it will increase the respect you should have for NATCA's member controllers, who have to do this stuff for REAL every day. Because in their world, when you hear that crashing noise, it's not just a sound effect coming our of the palm of your hand...and there is no game reset button.